Social insects, such as ants, bees and wasps, display an organizational complexity, called eusociality, where individual members of a colony act more like parts of a whole rather than independent organisms. In their colonies, each individual performs specific tasks based on which caste they belong to: either the reproductive caste or the worker caste. In many species, the reproductive role is determined in early development – by the time they are adults, queens and workers have set roles, complete with distinct appearances and functions. Remarkably, although ants, bees and wasps all evolved eusociality separately, all of their societies display this caste distinction. This begs the question: in these different organisms, have the same, or similar, genes evolved to differentiate social castes? One way to answer this question is to look at exceptions to the general rule. In many ant species, queen ants are much larger than their worker counterparts. However, in some species, such as the native Okinawan Diacamma species, there are few differences in appearance between the worker caste and reproductive caste. These species are called “queenless ants” as a result, though a social hierarchy that includes both reproductive and worker castes exists within their colonies. Top: Diacamma ant. Diacamma ants show no physical differences between the worker and reproductive castes, and each individual has the potential to reproduce up to early adulthood. 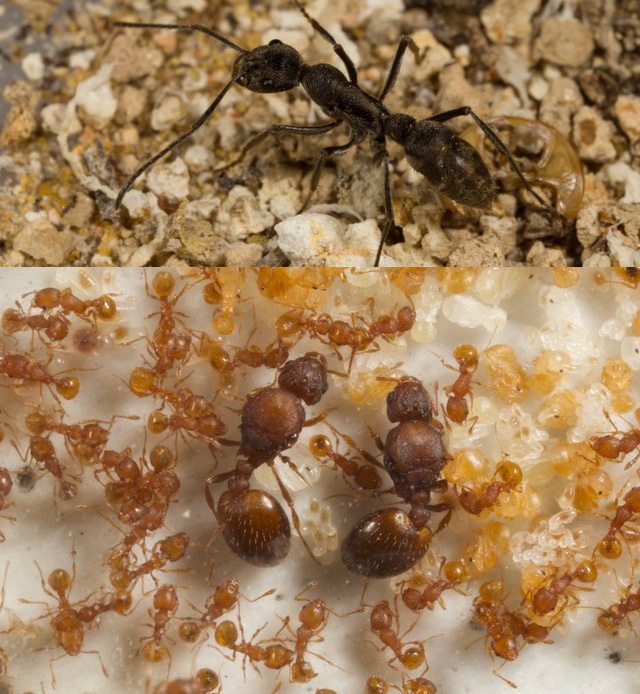 Bottom: Representing the more typical condition, Wasmannia auropunctata queens are surrounded by much smaller worker ants. Differences between queens and workers are fixed in early larval development. The lack of physiological differences between the different castes makes Diacamma a particular intriguing ant to study. “Unlike most ant species, where the ability to reproduce is determined during early development, Diacamma display an unusual biology in that every ant has the potential to become part of the reproductive caste until early adulthood,” explains Prof. Alexander Mikheyev, leader of the Ecology and Evolution Unit at the Okinawa Institute of Science and Technology Graduate University (OIST). When adult female Diacamma ants first emerge from their pupal case, they have a pair of wing-like structures called gemmae. Every female who retains her gemmae can reproduce, but horrifyingly, the reigning reproductive female, called a gamergate, attacks these young ants and mutilates the gemmae. This violent mutilation prohibits these females from developing ovaries, causing irreversible sterility. The sterile females then become part of the worker caste. However, if no gamergate is present, young females retain their gemmae and become part of the reproductive caste. The scientists wanted to determine how this mutilation affects the ants at the molecular level. To do this, the Ecology and Evolution Unit at OIST collaborated with researchers at the University of the Ryukyus and the University of Tokyo to collect Diacamma colonies from different locations on the island of Okinawa and study their gene expression patterns. In every organism, genes can be turned “on” or “off” depending on how they are regulated. Organisms with identical DNA can have different appearances, abilities, or functionalities based on which genes are turned “on”, or expressed. “We wanted to compare gene expression between the mutilated and non-mutilated ants at the same stage in development to see which genes determined caste differentiation.” Mikheyev describes, “from there, we could compare the gene expression patterns between different castes in Diacamma ants to those of other species to elucidate the evolutionary origins of eusociality.” This research revealed that only a small number of genes differentiated the reproductive caste from the worker caste, primarily in genes related to nutrition. This hints that increased energy requirement of reproduction may be a factor in the evolution of eusociality. Some of these genes have also been found to affect caste determination in other species, such as bees, wasps and other ants, though typically during development. The Ecology and Evolution Unit at OIST plans to use the results, published in Molecular Ecology, from this study to further investigate the evolutionary origins of eusociality. “We are in the process of conducting a follow-up study, comparing developmental profiles of gene expression in ants and honey bees, to explore parallels in how castes repeatedly evolved” says Mikheyev.